Just in time for the last Wii U-less holiday season is a new Blue Wii console coming to stores. It's exclusively going to be sold at Wal-marts and Sam's Clubs around the country. Will you be getting one? They're only going to cost $99.96... In Europe they're going to be sold with the new Sonic and Mario olympics game. In a way this is all kinda tempting... BUT, personally, there's no way in hell I plan to deal with huge lines and massive idiots during Black Friday. And not to bash anyone who does do that sort of thing, but I'm referring specifically to those who have trampled people and killed them... those kind of massive idiots. Anyway, who is brave enough to seek these bad-boys out? I'm not sure if this would apply to something super new (and potentially limited) like this, but apparently Amazon honors tons of Black Friday deals, so instead of being a sucker and waiting in line you can just hit up Amazon and order to your heart's content. Does the bundle in America include Wii Sports and Mario Kart? No, seriously, you can bash those people all you want. People are ignorant when it comes to this type of this. I have never went to one of these early black friday deals. People are ignorant for getting up at 3am to go shopping at 5am. Im not sure what the hell is wrong with retail stores. Why in the hell do they need to open so early. They could still wait to open at 81m, 9am, ect...have the same deals and they would make the same money. I'd go homeless first before every working in retail again. 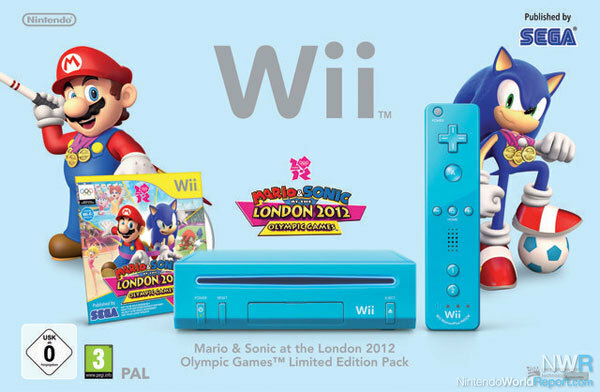 Anyways, on topic, that is a cool looking Wii, I would prefer it being a darker blue. NIntendo should have had all these different colors years ago. But no, they wait to the end, hoping some suckers will go out and buy all the different colors. $99 is a great deal and Im sure its the model that is not backwards compatible w/ GC games. Dang, 99 bucks? That's pretty sweet. The color doesn't look half-bad either. Its not really all that confusing, is it? People are eager to shop (because they feel like they have to buy a lot of stuff for their families and whatnot), and the earlier they can do it, the better. Also, if ONE store is opening at 5am when everything else is opening at 6am, Store #1 is going to have the monopoly on those shoppers. They're getting 100% of the market share at that point, and if someone has a list of generic things (pants, sweaters, movies, socks) and not specific things (ie: Delta Sonic gift certificate, Tickle Me Elmo, Target Special Blue Wii Sonic/Mario bundle), they're going to clean up in that department. If Store #1 is able to satisfy your list, Stores #2-#Infinity aren't going to get your business. Thats better for Store #1, and their competition suffers (and you know that this person is probably doing more shopping later that day, so the less stuff they have to worry about buying THEN, the better). Also, getting up early -- in theory -- allows you to beat the crowd. I went out last year and it was bonkers. I heard that some stores are opening around 10pm Thanksgiving Night this year. Yessss. Since I get out of work around 10pm / go to bed around 5am, this'll be awesome. Plus, some folks might have to work during the day, around 2p or whatever. Why is this so tempting? WHY?? Is the light still blue? What is with all these pastel colours? I miss the days of the N64. Solid deep blue. Red. Green. Those were colours. Although my blue 3DS is pretty bitching. I don't live near a Wal Mart, but $99 is very tempting. I'd get one just to hook up to the little TV in the kitchen lol. My wii has that pixilation problem and I've been too lazy to send it in to Nintendo (probably too late). This might be the answer to this dilemma. @shinriley If you own any downloaded games/content, then no. It's never too late to send in your Wii to Nintendo, though they will charge you for repairs if it's out of warranty. The charge should be less than buying this Wii would be though, and this Wii would also have no Gamecube backwards-compatibility.